When I mentioned that pictures do not do these works of art justice, this is what I am talking about. This is the most challenging afghan that Margo has ever done. It had five different colors with a sweeping design that made for frequent color swaps. Plus the thing is huge. You can see it covers the whole couch. Margo decided early in 2016 that she was going to make two gifts for the girls and their beaus. 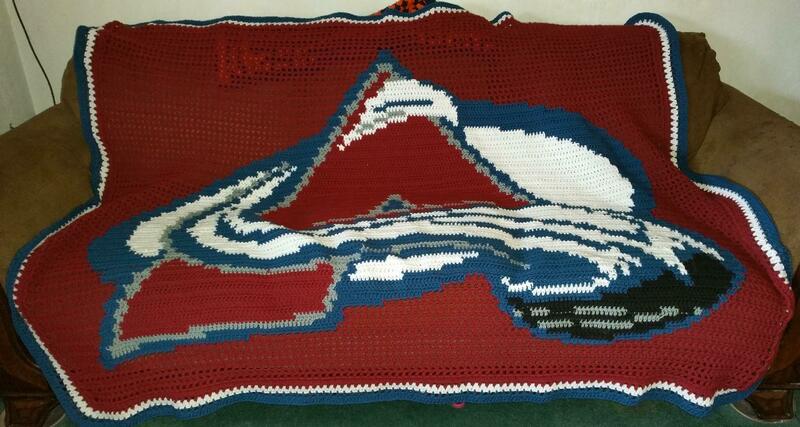 This one, plus a cross stitch were for Jessi and Pete, hockey fans. Margo designed the pattern herself and spent at least six solid weeks on this. I watched her pull out rows several time because the count was off. But, when she was done the logo would really jump out at you. One of my favorites!